Do you like Thunderheart? If the answer is yes (which is the correct answer, by the way), you may want to check out the trailer for Taylor Sheridan’s new feature, Wind River. As an actor, Taylor Sheridan appeared on things like Sons of Anarchy and Veronica Mars. But it’s as a writer that he’s gained the most acclaim recently, penning gritty, crime dramas Sicario and Hell or High Water. Wind River looks to fit nicely into that realm. This time, in addition to writing the script, Sheridan takes the big chair. People keep calling this his directorial debut, but he apparently helmed a horror joint called Vile back in 2011, so I don’t know what that’s all about. And I don’t really care enough to find out, it’s just a mildly interesting factoid. 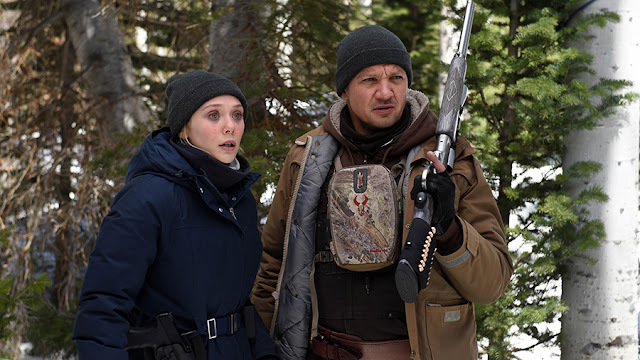 When there’s a murder on a remote Indian reservation, Wind River follows the young FBI agent, played by Elizabeth Olsen, tasked with solving the case. She teams up with a local tracker an all around grizzled dude (and fellow Marvel vet), played by Jeremy Renner. The cast also includes Jon Bernthal (they really mined the Marvel camp for this one), Graham Greene, Martin Sensmeier, Gil Birmingham, and more. Wind River collected strong reviews out of Sundance this year, and it hits theaters on August 4. It also screens as part of the Seattle International Film Festival in a few weeks, so I’m hopeful I’ll be able to catch it there.